The leaves are turning, the swallows are no longer dipping over the rock pools, but this long, warm Cornish summer never seems to end. We set sail from Hannafore over a barely rippling sea in the good ship Red Canoe to seek secret beaches, pirate caves and, of course, photos of interesting marine creatures. 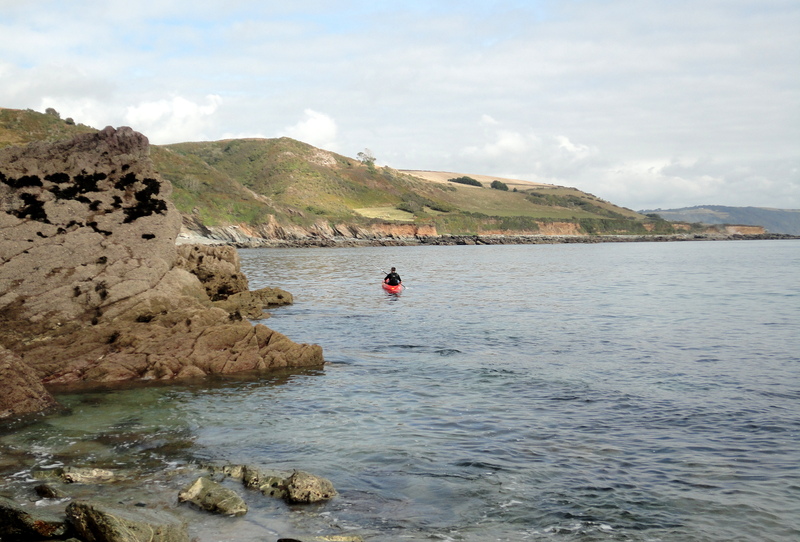 We paddle through the channel between Looe Island nature reserve and the mainland, watching for rocks and enemy ships. A lone grey heron, fishing in the newly exposed pools, twists his head to watch us. A fishing boat motors past in the distance, heading for harbour before the tide falls. We spy a distant patch of sand framed by high cliffs and scattered rocks, inaccessible by foot or large boat. My five-and-three-quarter year old takes over command of the vessel, paddling furiously then calling orders until we line up and let the small waves carry us onto the shore. 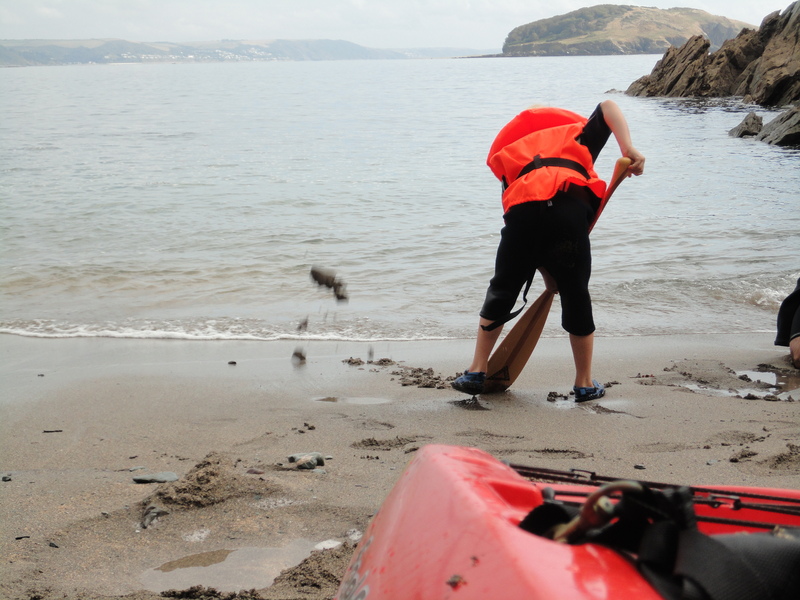 With Red Canoe safely hauled away from the reach of the waves, my son sets straight to work, drawing an X in the sand, pretending to discover it, then shovelling with his wooden paddle. My partner, Ed, makes a sandcastle and climbs the rocks. No prizes for guessing what I do. The rocks here are exposed to strong winds for much of the year. Animal life hides in the wave-gouged pools and in the lee of the huge rocks. Dog whelks lie in wait for hardy limpets. Green-leaf worms longer than my hand forage among the barnacles. 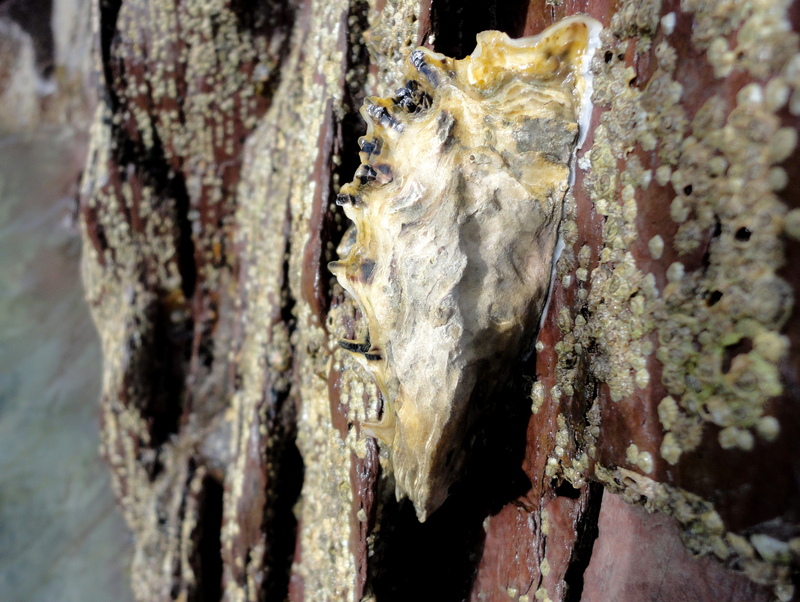 A lone oyster clings to an overhang. For a second I hope it might be a rare native oyster. 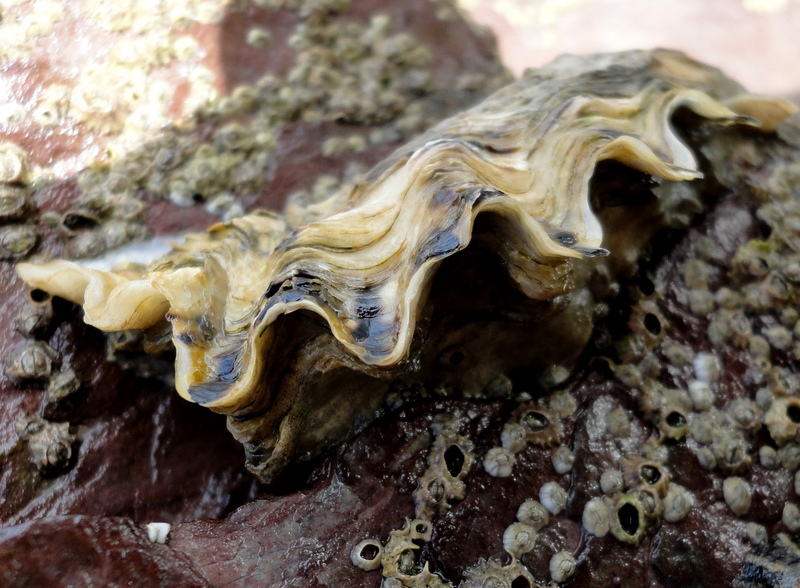 On closer inspection its long shell and frilled edges show it’s an invasive Pacific oyster. Side view of Pacific oyster. 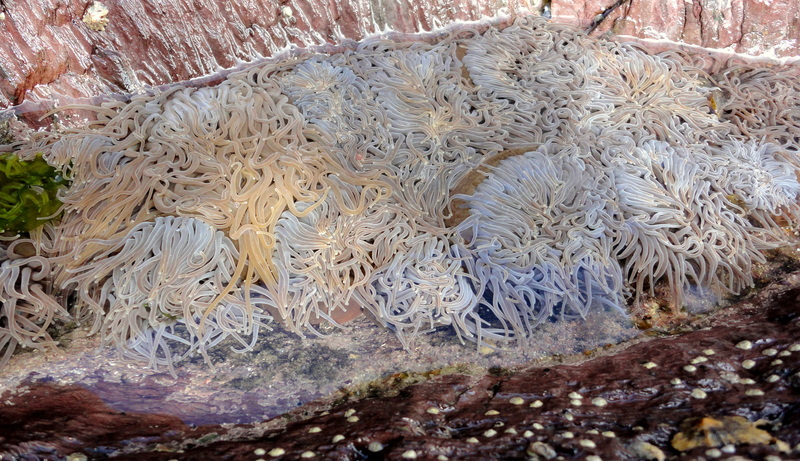 One small crevice in the rock-side holds a pool so packed with snakelocks anemones that the water inside is just a seething mass of tentacles. As I watch, a small fly lands and the tentacles writhe, breaking the surface tension and pulling the fly under. A tiny crab has made its home in a patch of anemone free water, well-protected from other predators. I swim out and watch corkwing wrasse drifting around the small patches of kelp and thong-weed. 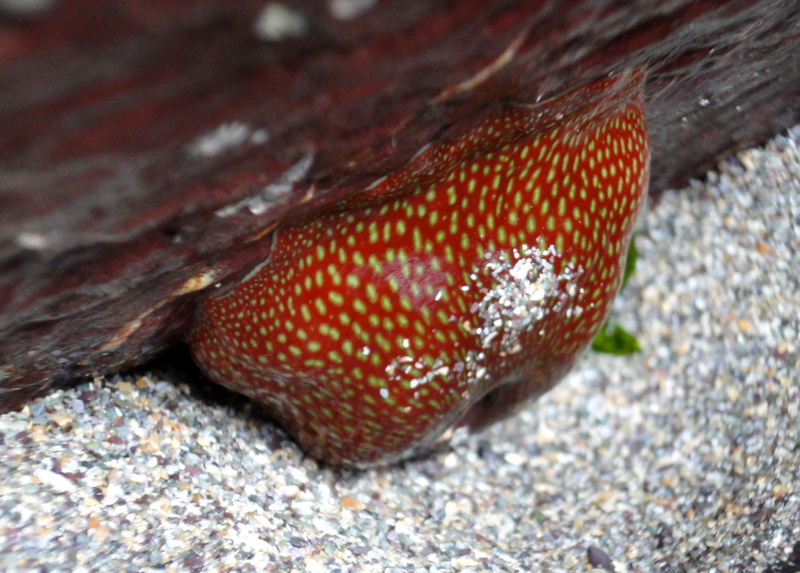 Wading back through a narrow corridor between two sheer rocks, I find a strawberry anemone, a cushion star and patches of bright orange sponges. Kelp slides around my legs and waves surge past as I try to photograph a small white clump of tentacles, possibly a juvenile plumose anemone. 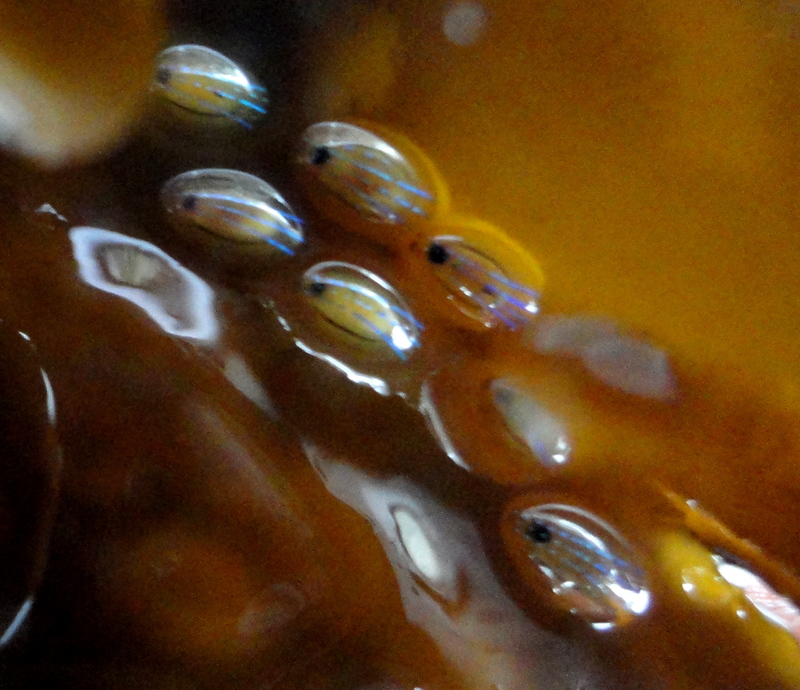 I lift the strands of kelp and find hundreds of blue-rayed limpets attached to them, their iridescent dashed lines twinkling in the sun. 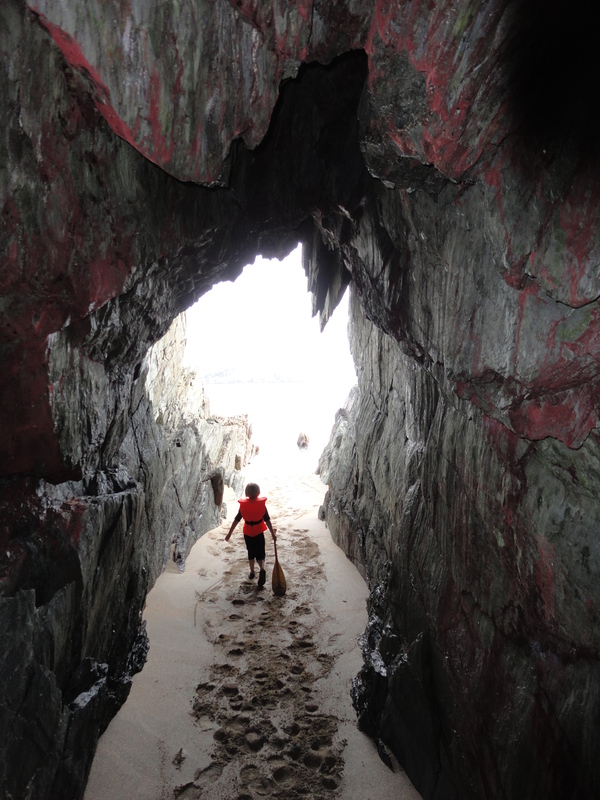 We paddle round to the next inlet, where a pirate cave awaits. My son grips my hand tightly and we walk into the darkness, as far as we dare. We can’t see the end. He rushes out in fright, then comes back. Again and again. 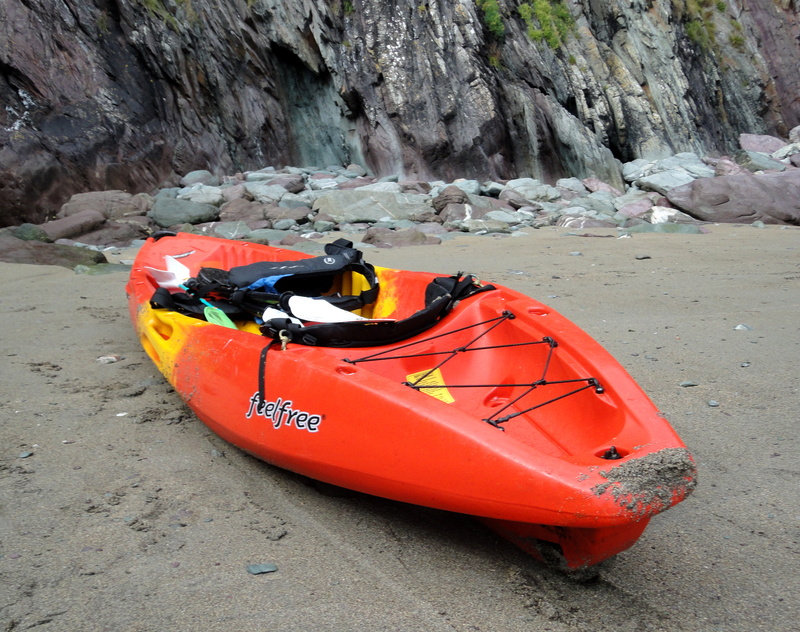 The tide is very low now and sharp rocks are close to the surface as we paddle our way out of the inlet. An oystercatcher passes us, whistling loudly and a greater black-backed gull chick swoops overhead. The heron, much closer to us now the lower shore rocks are exposed, watches us glide back into Hannafore. We finish our adventure in true pirate style, with a pasty and an ice cream at the kiosk. Glad you enjoyed it Mezbg. A lot of our adventures end with pasties and ice cream :D. Some of the photos were taken in very tight rocky gullies with the waves rushing in – it all adds to the fun. What a brilliant adventure, and great pics too. Thanks for sharing. Sounds like loads of fun. Beautiful pictures – my favourites are the Dog Whelk (which is deserving of a more glamorous name, I feel) and the Strawberry Anenome. Thank you Single Malt Female. Glad you like the pictures. 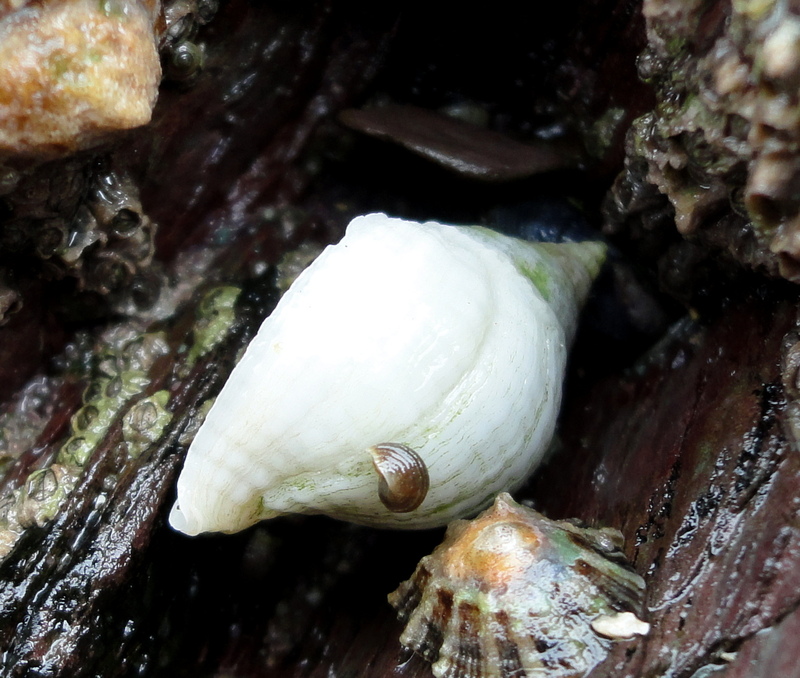 The Latin name for the Dog whelk is ‘Nucella lapillus’, which sounds nicer than the English and, I think, means ‘Pebble nut’. Nucella also rhymes with Nutella, so can’t be bad.